Just when fans thought all was lost when the super busy Guillermo del Toro opted not to direct the long in development 'Dark Universe' comic book adaptation, uber-producer Scott Rudin has picked up the cause and is fast-tracking it into a possible 2016 production at Warner Bros.
Based on characters from DC Comics' 'Justice League Dark' series, the movie "involves a series of ancient tomes stolen by a madman hellbent on the destruction of humanity. When he learns of this, occult detective John Constantine seeks out a group of heroes that specialize in the mystic and arcane in order to save the world," according to Tracking Board. Del Toro will remain on as a producer, but Rudin is having the script polished and shopping for a director. It's unknown for certain which JLD characters will make the roster but Del Toro has previously mentioned wanting to include fan favorites - Swamp Thing, Zantanna, Deadman, Etrigan the Demon and of course John Constantine. NBC was the recent home of the 'Hellblazer' adaptation, 'Constantine,' starring Matt Ryan as the titular hero but was prematurely canceled. Despite Ryan reprising his role for an episode of CW's 'Arrow' this season, the movie role is expected to be recast. The DC cinematic universe continues to grow as 'Dark Universe' joins other off-shoots from Warner Bros. that stray from the giant slate of films previously announced. 'Batman V Superman: Dawn of Justice,' 'Wonder Woman,' 'Aquaman,' and two 'Justice League' movies are part of that big plan but 'Suicide Squad' and a planned 'Booster Gold/Blue Beetle' buddy film hope to expand offerings with unique cinematic experiences. There'll also be some connectivity. 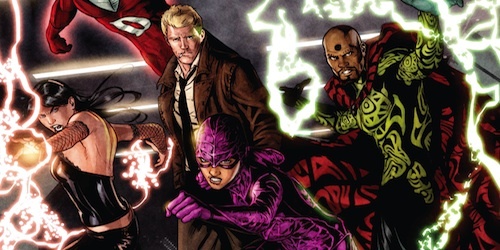 The group established in Dark Universe will separately co-exist with the main Justice League team, much like how Marvel’s Guardians of the Galaxy operate individually from the Avengers. Though, the plan is to eventually bridge the worlds and plant Dark Universe members in other DC titles. With a veteran producer like Rudin involved, who's no stranger to juggling projects, the future of 'Justice League Dark' has never looked brighter. Dark Universe DC Comics Guillermo del Toro John Constantine Justice League Dark movie Scott Rudin Warner Bros.
Labels: Dark Universe DC Comics Guillermo del Toro John Constantine Justice League Dark movie Scott Rudin Warner Bros.